Confirming the rumors, and after dismissing the iPad as nothing more than a large phone, Google is getting ready its own tablet computer. At least, that was what Google CEO—and Steve Jobs' own personal Judas—Eric Schmidt is saying. According to the New York Times, Schmidt told friends about the new tablet at a recent party in Los Angeles. NYT's sources point out that Google has already been talking with publishers about delivering content for the platform. Surprisingly, Schmidt said it will not run Chrome OS—as recently shown by a Chrome OS engineer—but Android, making it the true big phone Schmidt was mocking. It makes sense to build on Android, since it already has applications. 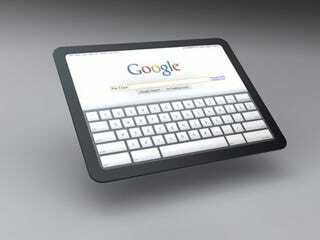 Is This How a Google Tablet Will Look in Action?